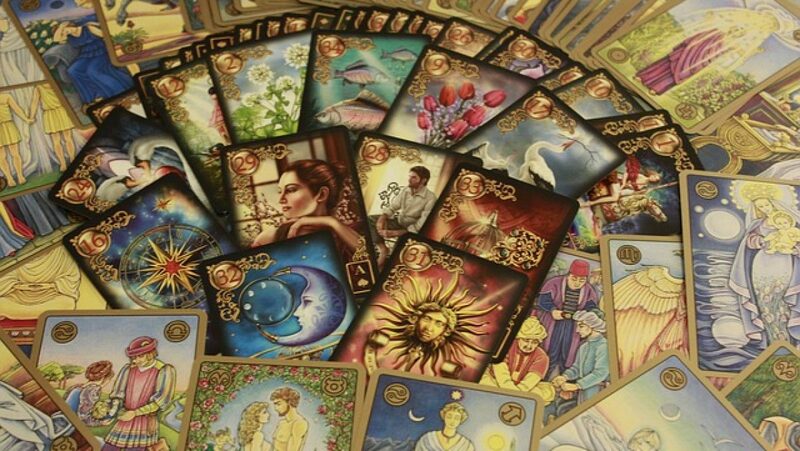 As I have seen, depending upon the author of the Tarot card deck that is being used this card has a few different names: The Hierophant, The Pope, The High Priest, or simply Faith. We see a man dressed in a robe and standing between two pillars indicating duality, in this case Spirit and Matter. The Hierophant is the bridge between the two. He is an older man indicating wisdom. This card usually points to help from someone of trust, someone you look up to or hold in high regard. This doesn’t necessarily mean it has to be a man, just a person you are comfortable with and trust, they have knowledge about a subject that you do not yet possess. They are a ‘seer’. This could be a mentor, teacher or a religious figure of course! In addition this card also refers to large institutions that have a set way of doing things such as hospitals, educational establishments, government offices, churches, banks or other large organizations where rules are set and carried out without question. In order to gain entrance to one of these establishments you must embrace their doctrine, their set of beliefs so as to obtain their education and enjoy the tradition. All these institutions have a set way of working, of thinking and sometimes it can be very hard to implement change, even when the change would do some good. When viewing the card as The Priest, men have become priests for all sorts of reasons. Some because it of ambition, family pressure or tradition although that is not seen so much these days there are a few that still feel a calling to God and choose this as their profession. How do you discover and connect with God? In my opinion to discover the Spiritual within you must go into the deep crevices of your own mind and really clear out the cobwebs to make clear what you believe, know or think you know. This can be a bit treacherous as you must make some uncomfortable confrontations with your own beliefs. Perhaps it is time that you need to review and start recreating your own personal awareness of God? When this card comes up it in a reading it can indicate that you are following traditional values. However, have you truly stopped to think about these? What do they mean to you? Are they in alignment with your ideas and feelings? Or are you just following along because this is the dogma you were taught and not allowed to ask questions so as to obtain a deeper knowledge? Perhaps it’s time to find a deeper meaning to life by exploring your spiritual matters. Many are born into a religion and follow this without ever a second thought to the orthodoxy of it. Those that accept this continue on their rigid pathway and are usually dismissive of new ideas and information. Do you still accept these beliefs? Or are new ideas or even questions about the custom now coming to mind? If so, now would be a good time to connect to someone who is open to your questions. The wise and patient counselor, teacher, elder will embrace you with open arms making you comfortable to be in their presence. They will listen to you and give advice but not the answers to all your questions. The Hierophant knows that the answers to your truths will need to be unlocked by you so the gain of deeper knowledge comes to you of your own volition. It’s okay to rock the boat a bit, that’s how eyes are opened, including your own!